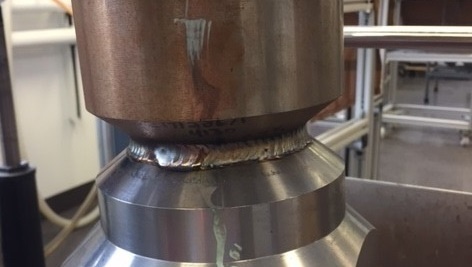 A company that specializes in flow control solutions turned to THE LAB at Ambrell to heat a steel valve to 400 °F (204 °C) for a welding preheating application. This process is new to the customer and they turned to induction because of the potential for rapid heating and reduced cycle times. THE LAB determined that an EKOHEAT® 10 kW induction heating system would be right for this application, and they designed a multiple-turn internal bore helical coil for the application. Temperature indicating paint was applied to the part and heating began. It was observed that the depth to which the coil was inserted was critical to heating both above and below the weld joint. For this application, heating can occur with a single coil in less than five minutes. Using induction for preheating results in significant faster time-to-temperature for users. On some applications with thicker parts, it can literally shave hours from the cycle time. Heating uniformity, quality and safety are among the other reasons companies are increasingly looking at induction heating for this application. To learn more about applications like this one, visit our application notes page.